PREVIEW OF COMING ATTRACTION: In next month’s Pentecost FOD, which is primarily about the phenomenal truth that speaking in tongues is our only absolute proof of salvation, I will specifically address the ridiculously time-wasting brouhaha recently taking place among a lot of brethren whom I love. One faction is teaching the hideous lie that a Christian’s behavior can cause God to reject him for everlasting life. This lie is a stench in the nostrils of God, and, as we will see, He says just that in so many words. Despite any ram-a-lam to the contrary, it is most certainly the same lie as salvation by works. It is a slap in the face to our precious Lord Jesus, whose finished work is then apparently not sufficient. Stay tuned. Perhaps the third most famous Christian in history behind the Apostle Paul (see Movies In Review in the May FOD) and Martin Luther, Billy Graham deserved all the accolades he received both during his lifetime and after his death on February 21 of this year. Only God knows the full impact of his wonderful life and ministry, and He will certainly reward him abundantly. HOWEVER, Billy spoke about the end of his life on earth by promoting Satan’s original lie: “You shall not surely die” (Gen. 3:4). He said: “Some day you will read or hear that Billy Graham is dead. Don’t you believe a word of it. I shall be more alive than I am now. I will just have changed my address. I will have gone into the presence of God.” He added, “I look forward to seeing my dear Ruth” (his wife who preceded him in death). Does that square with what God says in His matchless Word? Not at all. Does it really matter? Yes, because it blatantly negates the glorious truth of RESURRECTION. How so? Because if there is no such thing as death, as Satan first proposed in Genesis 3, resurrection is superfluous. Sure, if all saints who died are already alive in “heaven,” what’s the point of reuniting them with their mortal bodies? Today, the most oft-used phrase to describe one’s death, even among unbelievers, is that Billy, or whomever, “passed.” Like it’s always football season. No, WORDS HAVE MEANINGS—he “passed AWAY.” He’s dead, he’s gone, he no longer exists in any form, and certainly not as a “soul” or “spirit,” as that is never how either of those words is used in Scripture. And he will never exist again unless Jesus really died, really conquered death, and really comes back to crash “the gates of the grave [not Hades]” and rescue all dead saints from the grave. I don’t know about you, but for the life of me I cannot fathom how a pure hearted, dedicated, humble, studious, and bold man like Billy Graham (and most other “big name” Christian leaders) could not see this clear truth—as well as many other critical biblical truths his powerful preaching not only failed to include but also contradicted. That should amplify to you and me the unspeakable privilege we have to know so many major biblical truths. In any language, including Hebrew and Greek, “death” is the END OF LIFE. It does not mean “separation from God,” a made-up definition by misguided Christians. Throughout the Bible, God and Jesus use a metaphor that vividly clarifies what death is like. In the Hebrew Scriptures (Dan. 12:2, et al), the Gospels (John 11:11ff, et al), and the Epistles (1 Thess. 4:13-18, et al), God artfully and euphemistically refers to death as “sleep.” Why? Because sleep is a TEMPORARY condition of UNCONSCIOUSNESS that ends with an AWAKENING. The “sleeping” one has no awareness of the passage of time. In his consciousness, there is no time between his death and his waking up in a new body. Simple. Death is of the Devil (Heb. 2:14). Death is not a friend that introduces you to Jesus. Death is the last enemy that will be destroyed (1 Cor. 15:26). Because of the sin of Adam, physical death is the inevitable end of life for each Christian, unless he is still alive when Christ appears to gather together his Body. As you may know, hearing a believer say, “when I die” is like fingernails on a blackboard to me. It’s “IF I die…” Jesus could come for us today. Stop and think for a moment about the horrible reality of death. Think how it cruelly ripped from your life someone you loved with all your heart. Perhaps you held his or her limp, lifeless body while you sobbed uncontrollably, crying out to God, “No! No!” Then suppose that person had come back to life in your arms. What a reunion! God emphasizes to us both the horror of death and the glory of resurrection so that we will fully appreciate the latter, and the work Jesus did for us. If the Church at large fails to change its position that the “dead” are actually “alive” (which is unlikely), it will unwittingly continue to play into the hands of spiritualists, adherents of Eastern mysticism, and the proponents of the rapidly growing New Age movement, who deny both the significance of Christ’s Resurrection and the unique opportunity for everlasting life through faith in his name. It will also continue to offer people a weak and false hope based on paganism, rather than on the comforting and satisfying truth of God’s Word: JESUS CHRIST IS THE ONLY MAN TO EVER CONQUER DEATH, AND AT HIS APPEARING HE WILL PASS ON THAT VICTORY TO US. The “old order,” brought on by the disobedience of the first Adam, was life unto death (Rom. 5:12). The new order that the Last Adam will institute is death unto life (John 5:24). Only THE MAN CHRIST JESUS has conquered death, and only he will then bring to pass the death of death. Just for the record, yes, God gave His only begotten Son, but not without Jesus’ full agreement to walk that lonesome valley of the shadow of death. At some point in his life, Jesus made a conscious choice—based upon God’s promises to him in the Hebrew Scriptures: to sustain him during his lifetime—all the way through his torturous time on the Cross—to raise him from the dead, to highly exalt him as Lord and Christ, to have him raise up all believers from the dead, and to make him King of the World. And he stayed faithful to that calling. What a man! What a Savior! What should be our response to his valiant effort? For the love of Christ constrains us; because we thus judge, that if one died for all, then were all dead:And that he died for all, that they which live should not henceforth live unto themselves, but unto him which died for them, and rose again. OK, that was a brief review of extremely important and pertinent biblical truths that you and I should know and be able to articulate to others. For a more thorough exposition (100 pages) of this vital topic, see Is There Death After Life? I guess one might say that I’ve been staring death in the face for the past four years. As many of my old NO FEAR T-shirts say, I am not afraid of death, but if I were to kick the proverbial bucket (as opposed to dunking on it) I’d be really hacked off (a) to leave my precious Elizabeth alone, especially after all the tragedy she has already had in her life, (b) to no longer be able to teach the Word and exercise my ministry for the Lord, (c) to leave my daughter, son-in-law, and three precious grandchildren, (d) to leave so many truly dear family and friends around the world, and (e) to miss this year’s NBA Playoffs. Oh wait, I could watch from heaven. Talk about nosebleed seats. By the way, if you see a giant blue bunny leaving stolen chicken eggs on my lawn, please let me know. 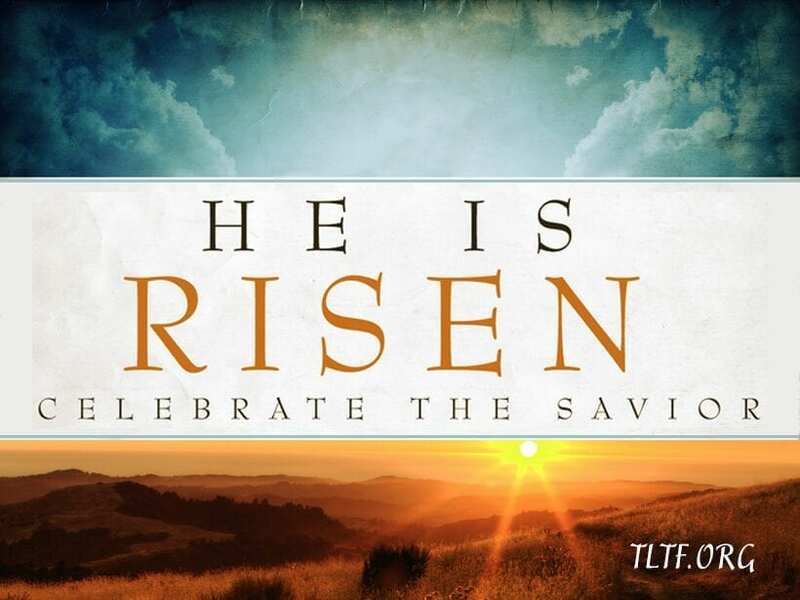 “HE IS RISEN!! !” (Jesus, not the stupid rabbit).